Download Sully in Digital HD from the iTunes store. 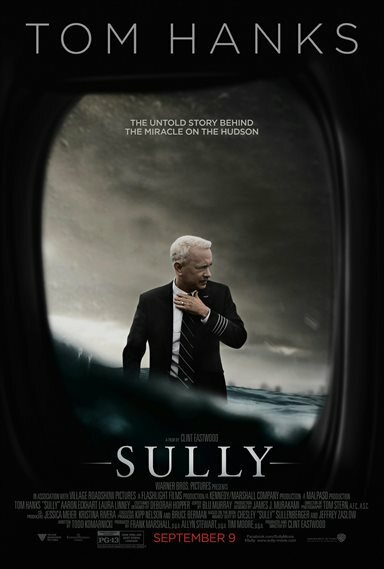 Sully images are © Warner Bros.. All Rights Reserved. It was any other normal day in January 2009. People rushed around the always crowded LaGuardia Airport on their way to destinations all over the world. For Chelsey "Sully" Sullenberger (Tom Hanks; Bridge of Spies) and Jeffrey Skiles (Aaron Eckhart; The Dark Knight), it was just another day "at the Office" in the cockpit of the airbus 320. What made this day different was the events that occurred shortly after takeoff, cementing both men, but particularly Sully, as certified heroes in the minds of the country. After taking off from New York, on its way to Charlotte, NC, the plane had a "bird strike" (flying through a group of birds which causes damage to the plane), which rendered both of their engines inoperable. The pilot and co-pilot tried unsuccessfully to restart the engines and when they realized they were in trouble, they then alerted air traffic control. ATC then offered them emergency landings at both LaGuardia and Teterboro airports, but realizing they wouldn't be able to make either, Sully made the bold decision to land in the Hudson River. Amazingly, the plane landed intact and all 155 people on board made it out alive. Touted as a hero, Sully faced scrutiny from the National Transportation Safety Bureau. Looking for a "scapegoat" the NTSB "simulated" that the plane could have safely landed at either airport and felt Sully had made the wrong decision. Outwardly, the country loved Sully but behind the scenes he feared he would lose his job and his hard earned reputation. Ultimately Sully fought back and proved he made the right decision, exonerating him and Skiles. I will admit, I wasn't exactly looking forward to seeing this film and I couldn't imagine what made Hanks take on this role. Being real life, we all know how the story ended so I wasn't sure how Director Clint Eastwood (American Sniper) was going to keep the audience engaged. I severely misjudged this film and Eastwood, though. Sully was interesting, insightful and blended just enough drama to keep me watching. Much of the reason the movie works is because of the cast. Hanks was fantastic as the stoic pilot turned reluctant hero whose brave decision saved hundreds of lives. He enveloped the essence of Sullenberger making the audience forget he is an award-winning actor. Eckhart was a terrific casting choice, as well, and the dynamic between the two men was perfect. The supporting cast was also great, with no bad performance among any of them. Tom Karmarnicki (Perfect Stranger) wrote a masterful screenplay, which thankfully doesn't go in chronological order. I expected to be taken through the events as they happened, beginning with Sully entering the plane, but that doesn't happen and it makes for a more interesting film. Eastwood also has a great eye for scenes and, at times, draws the audience in to make us feel as if we were really passengers on the plane. The cinematography was spot on, depicting New York City in all its splendor and displaying the Hudson River as one long, wide runway just waiting for a plane to dare to land on it. My only complaint was that as New Yorker on 9/11, I found it difficult to watch the scenes where a plane flies into a high rise building. The CGI moments, however, were well done and don't look as if a plane is flying through a fake sky. The way this story was told made it seem fresh, even though I knew the ending. Great acting, excellent directing and a strong script brought the human element into what could have been a disaster of a film. It's no coincidence Sully is coming out now as the Oscar race is ready to heat up and I could see it garnering a few nominations. If you are interested in a serious drama, I can't recommend it more highly.